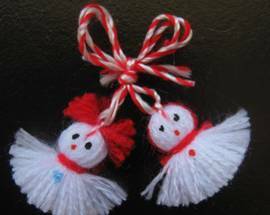 Holidays and Traditions Bulgarians love to celebrate and their calendar is full of traditional and other festivities. 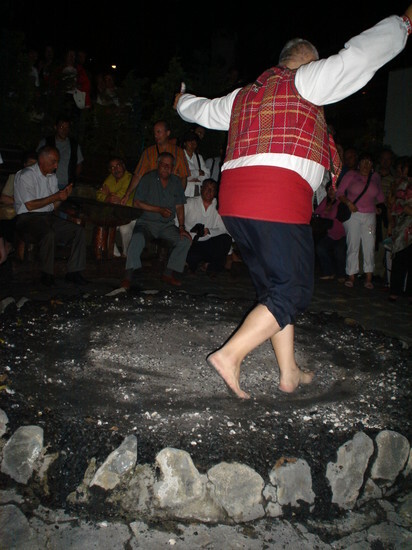 The extent to which some of the more traditional holidays are celebrated may vary from region to region and the folklore traditions are more prevelent in rural Bulgaria than in the larger towns.A very important role is played by the Name Days. Most name days are fixed calendar days although some are related to religious events such as Easter and therefore fall on different dates each year.Friends and family are free to visit those celebrating their name day, bringing gifts and flowers. Typically the person celebrating, will also share out chocolates or other treats amongst his work colleagues on that day. Not only do the Spring months mark one of the most charming times of the year to experience Bulgarian cultural and folklore traditions such as the Martenitsas, but also some of Bulgaria's most significant holidays (such as the National Day and Easter) are celebrated at this time of year. Here are just some of the celebrations one may come across. March is generally known as the woman's month because the weather is said to be as moody as a woman's mood swings (Cold harsh winter/ warm and pleasant spring)"Chestita Baba Marta" is how Bulgarians greet each other on this day. They then present each other with martenitsa's. 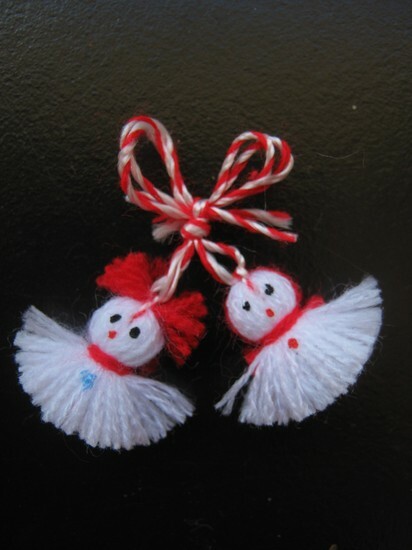 Red and white woolen threads entwined, symbolising health and happiness for the coming months. 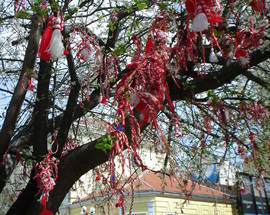 You will see stalls all over town selling martenitsas, starting at around 50 stotinki for the most simple ones. Each year the assortment on offer gets more elaborate. 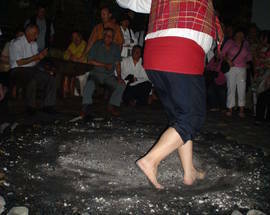 Martenitsas are usually pinned to lapels or tied around wrists and worn till the first stork is seen. They should then be tied on a fruit tree or buried under a stone whilst making a wish. It is believed that on this day god drives forty hot spikes into the soil and the sun turns to summer. It is time to sow and plant. Housewives should cook 40 stuffed peppers and everyone should try to eat 40 different items on this day as a protection against measles. Celebrated on the first Sunday before Lent, the rituals are to ensure fertility, prosperity and health. The younger generation also seeks forgiveness from the older generation on this day and in the home games are played with the children by suspending a bit of coal, an egg and some cheese in turn on a red thread hanging from a ceiling beam. As the symbol swings round in circles so the children must try and catch them with their mouths. Always celebrated on a Saturday, 43 days before Easter, Todorovden is also known as Horse Easter. The health of the working horses is celebrated and in villages across the country you will see horses decorated with red pompoms and crowds gathering in nearby fields to watch young men racing the horses. According to tradition this is the day when migratory birds such as storks and swallows return, marking the awakening of spring in nature. Homes are cleaned and garbage is burnt to get rid of any illnesses from the past year. Always celebrated on the Saturday, a week before Easter this is a 'coming of age' celebration for young girls known as "lazarki". The maidens are dressed in colourful tradional costumes, with wreaths of flowers in the hair, singing and dancing as they go from home to home. This is also the orthodox 'Palm Sunday'. Most people go to church on this day, they buy some willow twigs which are blessed and then tied to the entrance of the home as a proclaimation of faith in the resurrection of christ and also for good health. 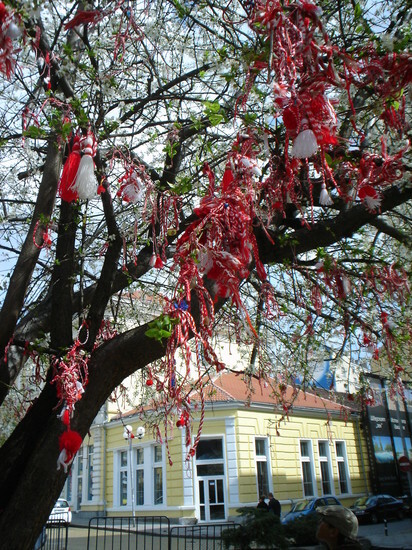 In rural areas rituals with the "lazarki" continue.All who are named after flowers and trees celebrate their name day on this day. As the Bulgarian name implies "Velikden" (great day), Easter is one of the most significant holidays in the Bulgarian calendar and starting with Palm Sunday, the holy week leads up to the Great Day. The traditional Easter eggs should be prepared on Maundy Thursday or on the Saturday. Superstition does not allow the eggs to be painted on Good Friday.At midnight on Saturday, people will go to church with their red (symbolic of the blood of Christ) painted egg. The priest will proclaim three times "Christos voskrese" (Christ has risen) and the congregation replies "Vo istina voskrese" (Indeed he has risen) and knock their eggs together with their neighbour. They then light a candle and return to their homes. Easter eggs are of great symbolic importance. They represent the beginning of all life. 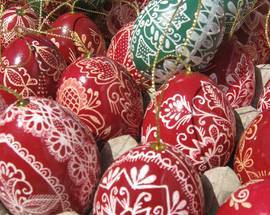 According to tradition the first egg to be painted must be red. The housewife can then use this egg to rub the forehead and cheeks of her children for good health." May you be healthy, white and red!" 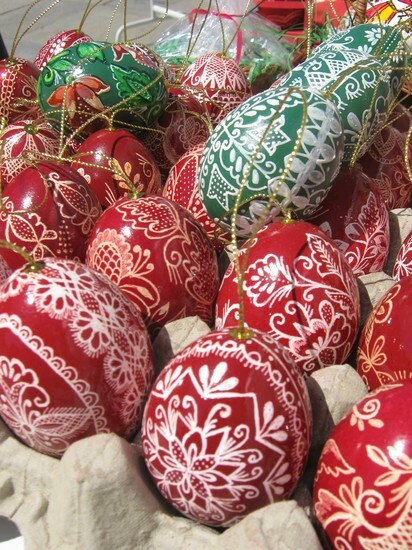 This egg is then kept in the home next to an icon till the following Easter.A basket of eggs is essential on the dining table in every home over Easter along with the special Easter bread, more commonly referred to as Kozunak. (A sweetish bread cake made from yeast dough). Family, neighbours and friends greet each other with the 'christ has risen greeting and exchange eggs and bread. For many Bulgarians Easter sunday marks the end of their vegetarian diet. As the family gathers around the table each member selects an egg, which is then knocked together with the others to find the victor i.e. the strongest egg. St. Georges Day is celebrated in Bulgaria on the 6th May and traditionally roast lamb (usually whole) is eaten on this day. St. George, the dragon slayer is celebrated as the patron saint of livestock. According to legend both Konstantin & Elena were selected by God to be his assistants, after they showed courage and faith by walking on glowing embers with bare feet. This day is celebrated by fire dancers in the Strandzha Mountain region.